Paskalis Glabadanidis, "Absence of Arbitrage Valuation: A Unified Framework for Pricing Assets and Securities"
Theoretical finance has always recognized the power of the simple dominance argument in valuing bond prices, options, equity, and cash flow. Yet what remains unclear is how far a simple dominance framework, coupled with a minimum of equilibrium asset pricing theory, goes towards pricing assets and securities. Such a framework also extends to incomplete financial markets, which provides useful applications for using discounted cash flow valuation and absence of arbitrage valuation simultaneously. 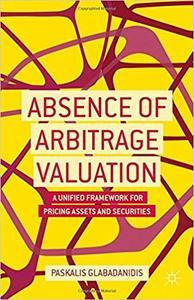 Absence of Arbitrage Valuation presents a unified asset pricing strategy through absence of arbitrage and applies this framework to such disparate fields as fixed income security pricing, foreign exchange spots, and forward rates. Glabadanidis argues that all valuation is relative and unique to the replicating portfolio argument from option pricing theory. This work reveals how absence of arbitrage valuation can be applied to bonds, international finance, and real options. Readers are also shown how this type of valuation can be applied to the pricing of new financial instruments, such as contingent convertible debt and weather derivatives.